What leads to a chronic or non-healing wound? Wound bed preparation offers a structured and systemic approach to assist with the management of wounds, so healing can proceed through the natural stages. Vetericyn Plus® liquid can be used for mechanical debridement of acute and chronic wounds. Liberally soak gauze and apply it directly to the wound for 3-5 minutes to clean and loosen necrotic tissue, foreign, and cellular debris. 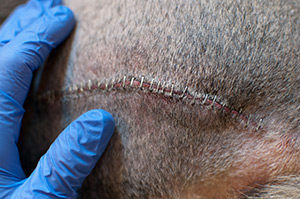 Use the gauze to gently scrub the wound; use additional sharp debridement tools as needed. Follow this procedure with lavage using Vetericyn Plus liquid. The active ingredient in Vetericyn Plus, hypochlorous in solution, is a known antimicrobial that has demonstrated efficacy in vitro against several strains of bacteria. Vetericyn Plus VF is specifically indicated to moisten dressings and the wound bed surface. Use Vetericyn Plus liquid to saturate the wound dressings during periods of heavy exudate production and Vetericyn Plus Hydrogel for moisture retention during the repair phase of wound healing. 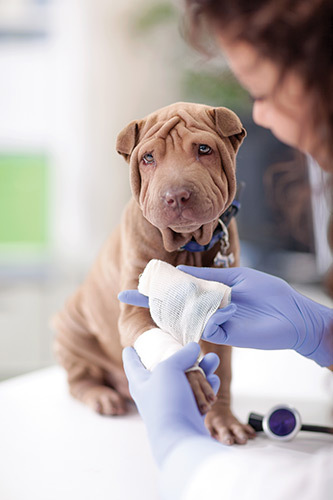 Vetericyn Plus Hydrogel is designed to adhere to the site of application allowing moisture penetration of the wound bed with or without the aid of bandaging. This can be particularly beneficial to wound care where bandaging is not possible. The Vetericyn team is dedicated to the best outcomes in wound care management. Our team of wound care experts and researchers are at the forefront of groundbreaking science and aim to create a lasting impact for patients around the world. The medical information on this page is provided as an information resource only, and should not be used as a substitute for professional diagnosis and treatment. By accessing this information, you certify that you are a licensed medical professional and agree to this notice. To agree to this notice and continue on, click anywhere outside this pop-up.